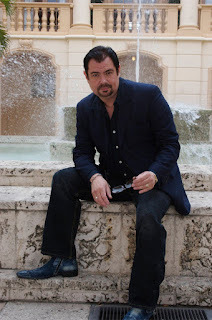 Founder, CEO and Designer Victor M. Vega or as we know him "Viktor Franovik" is the man behind Franovik Designs, Models&Designers magazine, Franovik's partnership with Motives Cosmetics and the newly formed Fashion Designers Association Florida website, under construction. Victor, born in Brooklyn, New York was always interested in the arts. Thought at one point that he wanted to become an architect; so he applied at Brooklyn Tech and Alexander Hamilton, both schools known for architecture. He got into Alexander Hamilton but later realized architecture was not for him. His parents both born in Puerto Rico wanted to move back to the Island, so in 1979 they all packed up and left to the island paradise. Puerto Rico is a beautiful place and living there was cool but not forever. After graduation, Victor went into communications at the University of Puerto Rico. Communications offered an array of subjects including commerical art. As part of the curriculum Victor had to design commercial artwork for a major corporation. The artwork ranged from business cards to picture boards, it was okay but something was missing. Victor's major was marketing and public relations. Fashion and styling was a hobby, something his sister and other family members enjoyed. So they designed for his number one client, Barbie, the true fashion model, including hair and make up. Looking towards his future, he decides to move from Puerto Rico to Miami, where he lives now. As the CEO of these companies, Victor manages all aspects of the companies from marketing to websites. When it comes to the artistic side of the companies, "Viktor" becomes the stylist that oversees all the models, hair and make up (MOTIVES), photographers, fashion shows, music, editorial photo shoots, bookings, and magazine content. With the newly formed Fashion Designers Association Florida, Viktor would like to get in touch with local designers to discuss what this new association should be and stand for. What we can achieve as a group within Florida, especially in South Florida. Check our his blogs: www.franovikcominfo.blogspot.com and www.causeambassadors.blogspot.com. Also check out these social sites: facebooks (viktor franovik & franovik viktor), Twitter (franovik), Sonico, LinkedIn, Plaxo, Bebo, Miamiurbanlife, Netlog, Squidoo, Mahalo, Quepasa (viktor franovik) and websites: www.franovik.com, www.modelsanddesigners.com, www.franovik.motivescosmetics.com and www.fashiondesignersassociationflorida.com (under contruction).